A new Firefox extension called Performancing for Firefox from Performancing.com is an interesting method of posting to your blog, including your WordPress or WordPress.com blog. I decided I would take it for a spin to see if it offered any improvements over the WordPress Write Post panel and functions. To install it, just install the extension to Firefox like any other download, though you might have to allow downloads from the Performancing site, but the download helps you do that with screen shot instructions. Very nice touch. You will need to close Firefox and restart it in order to complete the installation. I had a terrible time trying to figure out how to run the Performancing extension, so let me save you some pain and suffering. Simply right click on a web page and choose Performancing > Blog This Page at the top of your right click menu, or click the note pad with pencil in the lower right corner of your Firefox browser status bar. It will open Performancing in a split window at the bottom of your browser. You can resize this as you see fit to your browser window, showing more of the web page you are viewing, or more of the Performancing blog entry panel. 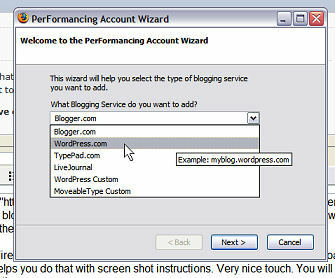 You will need to set up your blog account, so in the right side of the Performancing window, click on Setup Account. Just follow the instructions to set up the user name and password for the account. WordPress.com is one of the choices as is WordPress Custom, which will allow you to add your full version WordPress. You can then write your blog post in two methods. One is using the WYSIWYG interface and the other is totally HTML text interface, which can be accessed between two tabs, one with an A and the other with an <A> for the HTML interface. I really like how I can quickly move from WYSIWYG to HTML with one click. Sure wish WordPress had that feature. The title for the post is entered in the Title box and you can quickly add bold, italic, and underline attributes, as well as links, graphics, lists and more. Centering, left and right align or full justification is quickly and easily done by selecting the text and then clicking the appropriate button. You can control the settings by clicking the Settings function which allows you to control a few features. According to a tip from Andy Skelton, you should uncheck the “Use CSS for Content Style” setting for WordPress.com blogs. You can then write whatever you want, choose the category for the post on the right sidebar column under “Categs.”, and even view the most recent posts on your blog in the “History” tab. Then you can save it as a Note (viewable later under the “Notes” tab), which is another way of just saving your post while you work on it as it isn’t “saved” and a new screen loaded, just saved so you can continue working. Or Publish directly on your blog through the big blue button on the bottom right. What I really wanted was spell checking, which seemed to be part of the claim. So I went hunting. According to a discussion on the Performancing support forum, to add spell check, install the Firefox Extension called Spellbound which will add spell check to Performancing, and probably other online writing things you do. People are asking the author of Performancing to make spell check built-in, so maybe that might come in the future versions. You can preview your post before you publish it, and you can also view your blog and click on links from within the preview screen of Performancing to open up web pages in the upper part of the browser window, allowing you to do your research and still have the blogging screen open to write in. This is a very nice feature. There are still some features that I would like to see added to the next version. In particular, the link and image shortcut buttons do not include TITLE or ALT attributes, critical for meeting web standards for accessibility. I’d like control over the posting dates and times, so I can write future posts. Images must already be uploaded to the blog before you can link to them. The newest version of WordPress offers image uploading from the post screen, and while it isn’t perfect either, I’ve gotten used to adding images rather quickly through the Write Post panel. I’m just spoiled. And maybe it’s my touchscreen mouse pad on my laptop, but I’m having trouble getting the vertical scroll buttons to work. I can use the bar but the up and down arrows aren’t working with my computer. A minor annoyance. What is very annoying is that Performancing “assumes” how I like my HTML and layout and instead of turning double line breaks into paragraph codes (<p>), it turns them into two line breaks (<br />). It also squishes all the HTML into one big block, with no spacing between words nor code. Paragraph HTML tags may feature specific spacing or design elements that will not appear when replaced with line break tags, so this needs to be changed immediately, as far as I’m concerned. Performancing also does not start nor end the entire submitted post with paragraph tags, so none of the text in this post was styled properly. I edited this post and replaced all the line breaks with paragraph tags to maintain the overall look of the this blog. So far, just playing around with this, I really like it, except for the assumptions it makes with HTML tags. I’ll give it a try for a few days and report more on how it is working for me. Thanks to those brilliant folks behind Performancing. This is really a slick tool for bloggers. UPDATE: I’ve played around with Performancing for a few weeks and the issue over the HTML tags as line breaks instead of paragraphs is something I just can’t live with. It is tedious to edit the post after it’s been posted to remove all the line breaks and replace them with paragraphs. The whole purpose of Performancing should be to blog without constant interaction with the blog. The lack of ability to control the post date is even more annoying. Because it publishes immediately, I have to race to my WordPress Admin Panel, find the post, edit it, and fix all the HTML tags so the font will look right when published. Since I’m already in the Admin Panel, why should I bother with Performancing? Until these two things are fixed or added, I won’t be using it. It is a fantastic tool if your Theme has the WordPress Loop for content wrapped in a paragraph tag. If it isn’t, like this one on WordPress.com, where I have no control over the look, layout, or design, then this just won’t work. And without control of the date and time of the post, there is little value since I work so far in advance. If they fix these issues, let me know and I’ll give this another try. It’s a great first attempt, though. This entry was written by Lorelle VanFossen and posted on December 22, 2005 at 6:32 pm and filed under Web Browsers, WordPress, WordPress Tips with tags how to use wordpress, wordpress, wordpress help, WordPress Tips, wordpress tutorials. Bookmark the permalink. Follow any comments here with the RSS feed for this post. Post a comment or leave a trackback: Trackback URL. It’s got spell checking, post scheduling, auto image upload, built-in photo editing, one-step photo albums and lots more. When I have selected the posts Cat and published it has been posted to the General or Uncategorized Cat on both WP.com and WP.org blogs. It has also indented both the posts title and first para about 125 pxs. Performancing has just released an updated version, which I am hoping will fix a lot of the indention and HTML problems I mentioned. I didn’t have any problems with the Categories, but I’m still test driving it. I’ll keep an eye on it and let you know in the next few days. The lack of the paragraph tag and over usage of line breaks really frustrates me, since that is automatically added by WordPress (wpautop) and the lack of a paragraph tag ruins the look of my post fonts for this Theme. And make sure you tell the developers of Performancing about what you have discovered. The more we help them perfect this awesome tool, the better for all of us. You’ve done a realy good add-on. But now it belongs to SubscribeFire. I’ve searched the whole Net to find the best crossblog soft for managing my blogs, but i couldn’t find any, that could be better than yours.